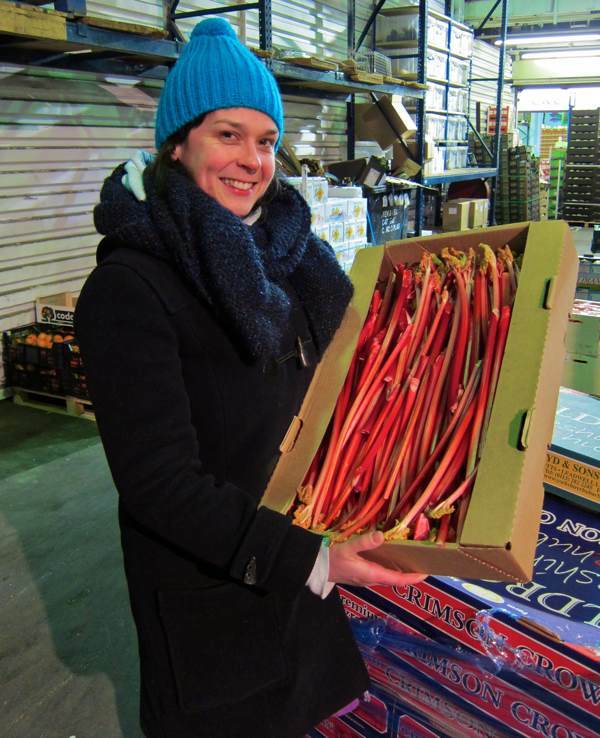 Lillie O’Brien & I were at Covent Garden Market before dawn to get the pick of the crop of forced rhubarb. It is the only English fruit that is in season now and we bought it straight off the truck that had driven down overnight from the famous Yorkshire Triangle, where a frost pocket sweetens the rhubarb naturally and, after four generations, the Oldroyd family still grow rhubarb by candlelight in the time-honoured method. Once upon a time there was a Rhubarb Express to deliver trainloads of rhubarb to the hordes of eager Londoners craving rhubarb, but yesterday there was just Lillie & me seeking rhubarb while the city slept. 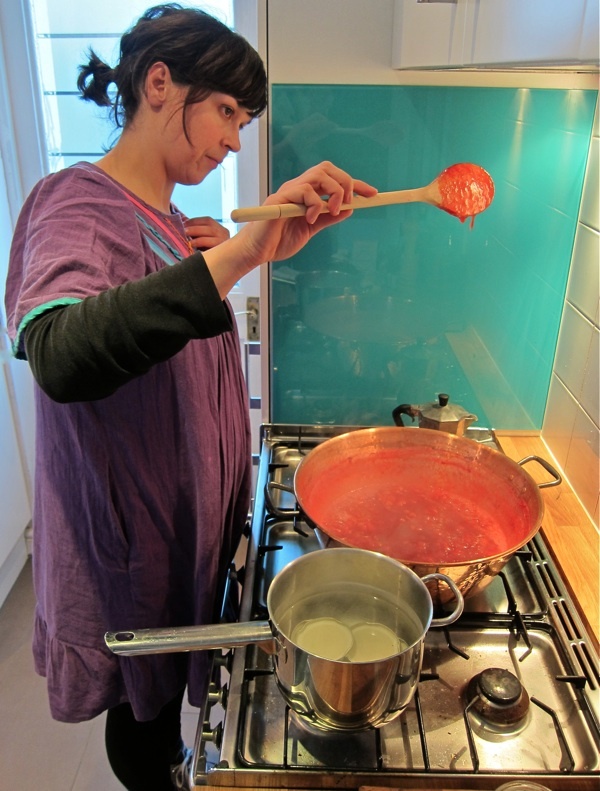 Formerly a pastry chef at St John Bread & Wine, these days Lillie O’Brien is the London Borough of Jam - a one-woman operation producing small batches of the highest quality preserves from the freshest seasonal ingredients. 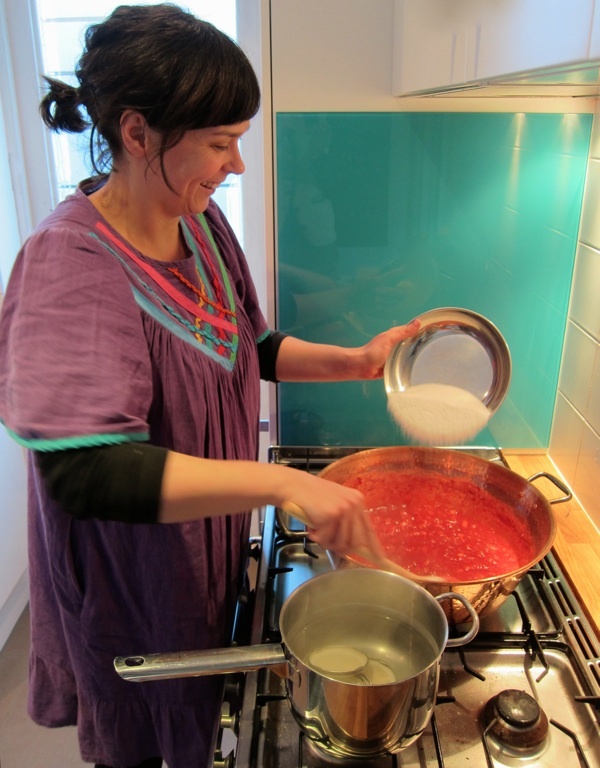 Our joint mission was to buy the best rhubarb, drive back to Lillie’s tiny kitchen in Clapton and make it into jam. At five thirty, we were driving down to Covent Garden and by ten thirty we had jam, it was a highly satisfactory achievement for so early on a January morning. At the market, we were greeted by Paul & Terry of Lenards wholesalers. By then, the night’s trading was already over but it was the ideal opportunity for a rhubarb hunt and Paul & Terry were the expert guides to lead us to the best options available. The one diversion from our rhubarb quest was for blood oranges from Sicily, and as I stood in the sub-zero temperature of the market, I was transported to Southern climes by the intense sweetness of the ruby-red flesh of this gleaming golden fruit. Lily took a box to make some marmalade. 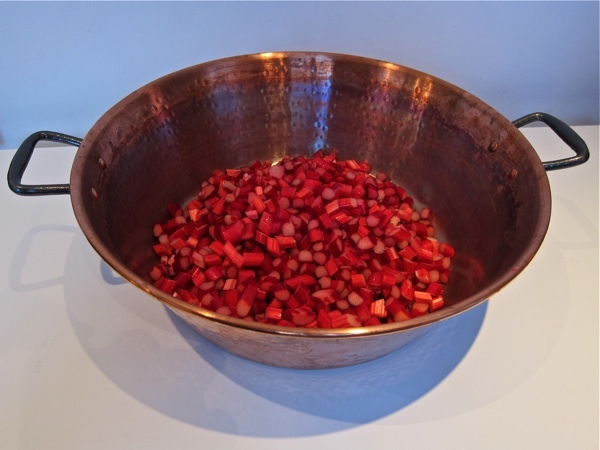 In a state of raging anticipation, we carried our crates of gleaming rhubarb into Lillie’s tiny kitchen and Lillie shrieked with excitement at the ice-cold water as she washed the stalks in the sink. We paused briefly to admire the aesthetics of the curly dappled flowers before we beheaded them mercilessly and Lillie chopped one kilo of rhubarb into small pieces, while Chester her cheeky blue cat rubbed at her ankles. 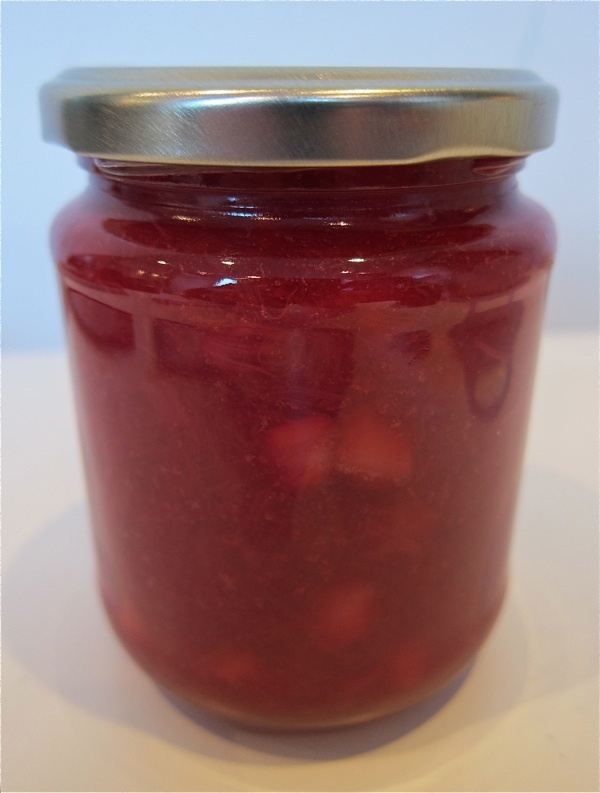 A lush deep pink jam with a vivid flavour that is more rhubarb than even rhubarb, a perfectly spreadable texture and a subtle piquancy of ginger – this is what I shall be having on my toast at breakfast, thanks to the London Borough of Jam. 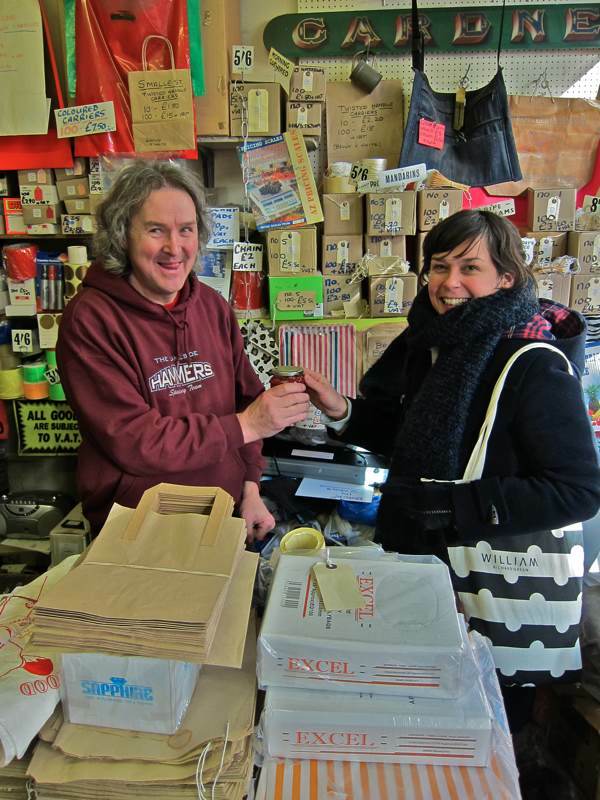 You can buy jams and preserves by London Borough of Jam at Leila’s Shop, Violet Cakes & E5 Bakery, and each weekend from Lillie’s shop at 51d Chatsworth Rd, E5 0LH. Lovely! Inspired to get into the kitchen and make some jam. A lovely lady a good combo with you. I love the young stuff red the stalks being a pencil thick. They are so tender and sweet can be nectar of the gods. There is an old saying Rhubarb-Rhubarb-Rhubarb not sure what this means? do you. John B.
Oh my goodness! 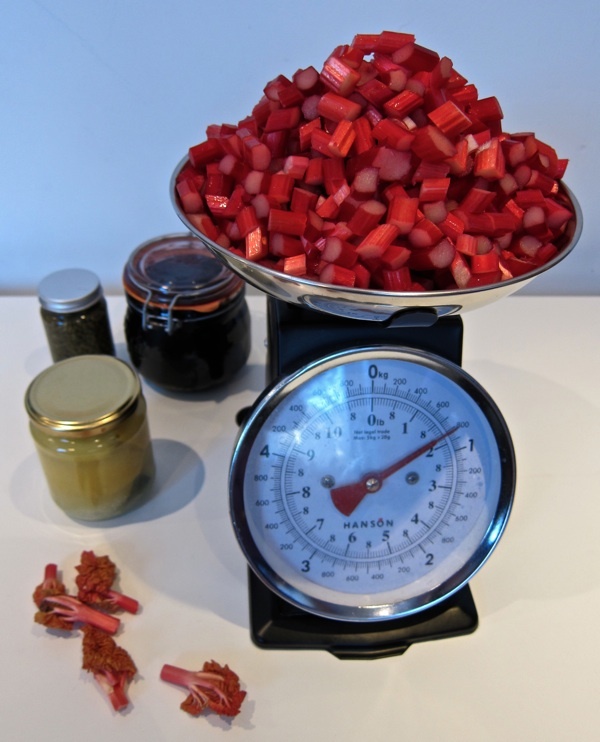 I’m afraid I just dribbled….I love rhubarb and ginger jam. I wonder if I could buy some on line? I live about 50 odd miles away from London although I’m a Londoner, born and bred. I love your blog and I’ve set myself the task (which will be a most pleasurable one) to read from the very first one through to the most recent one! I’m so looking forward to it. That jam looks yummy. Well done for getting up so early to record the arrival of the rhubarb, while the rest of us were safely tucked up in the warm. 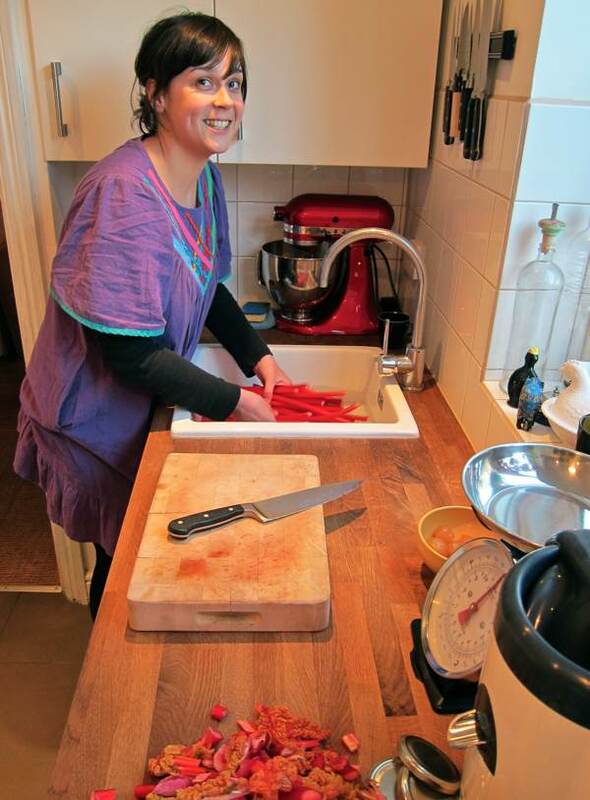 Lovely story, lovely rhubarb, lovely Lillie–but where’s a picture of cheeky Chester the CAT! I am confused. Surely the whole idea of buying fruit in season is to eat it fresh? Jam making was traditionally done to preserve a glut of the fruit. This article appears to be selective in its nostalgia & basically a promotion for this woman’s business. Lillie makes wonderful jam. Particularly the rhubarb. It’s my way of eating fruit. And her doughnuts are beyond compare. I had no idea she worked for St. John’s. Good training ground. And everyone knows Paul Gardner. I posted an Instagram of him yesterday and had so many comments. @sumasonlondon Thank you for your stories.